Gtalk is one of the widely used messenger services these days . Most of the people like it as it connects in even very less network speeds . When I was in college , I used to use this a lot . Unlike yahoo , one cannot set their status as invisible or idle . I don't know how to go invisible on gtalk , but I found a software which can set your status to idle on gtalk . After installing the software you can see four extra options in the right click menu of your gtalk symbol in system tray ." 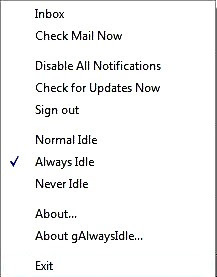 Normal Idle " , " Always Idle " , " Never Idle " , "About gAlwaysIdle " . Set your status to which ever idle you want after seeing the descriptions below . - Never Idle :- Prevents your status from gettng to idle . There are some bugs in this software while running with Vista according to my friend Tilak . Lets see whether they might fix it in their next release . Gtalk tips and tricks . Gtalk in Firefox Siderbar . How to detect invisible users on yahoo messenger ? How to run multiple instances of gtalk ? How to connect AIM , MSN and Yahoo with gtalk ? Crazy on Technova content ?? Get more updates on feed or get our newsletter via email . Is there any way to set status as idle on Blackberry Gtalk. When I am sleeping, the blackberry status still shows as if I am available. Is there any way out?